are heavenly, with their browning and taste. The bakery on the left serves theirs with squelch of oil. Let me start by apologising - what a cliché, again, I apologise - for not joining in the "holiday mood" - what a cliché - and posting a feel good post on Christmas, or even after taking much liberty to include this as as my tarting paragraph, falling short by not taking this opportune moment to bid you something to do with the various holidays and festivities. The holidays are a great time for promotions. Spending is greater than the rest of the year with few people saving for the occasion and a many others opting to spend their January salary in the last few days of December. As a few have learnt, the last few days of December can be game changers for an entire year. Businesses are also out to cash in on the "festive mood" - seems I won't be running out of clichés - by offering various discounts and offers to woo customers from their competitors. However, when a bakery at "AA" near Mukuru kwa Njenga started offering a free cup of juice to those made purchases above Ksh. 5, the spirit of Jesus Christ born more than 2000 years ago was not necessarily what prompted them to start the offer. The bakeries problem lay in another bakery, which fate had placed next door, with a column separating the two bakeries. While fate had decided that the two bakeries would exist in different buildings, fate had decided to have its way by having the two open at about the same time. Those who lived and conducted their business around the two bakeries would have sworn that fate had more than that to the two bakeries, but fate had decided that it had already reached its limits. Fate could not be blamed that the portfolio of pastries from the two bakeries bore a more than 50 per cent similarity, or the fact that the bakery on the left had had to remodel their donuts to match those of the competitors on the right. The bakery on the left had bigger doors, and a bigger area from which to serve customers from, but that could not be the reason why they sold more than the leftists. While the products could have resembled each other in name and general appearance, that was as far as the resemblance went. The bakery on the right had the golden brown touch on their products , perhaps attracting those who could discern the difference in colour and detail. I mostly shopped here, not because the products looked more baked than those on the left, but something about the place seemed more right than the one on the left. It was just last Thursday that I visited the bakery on the right, and found that the doughnuts were not ready. I decided to get them form the left baker, where they were several. It is then that I found that they had an offer of juice for purchases greater than Ksh 5, which I immediately exceeded by 10 times worth. As my order was been served, the baker, a burly man, with a scruffy beard , appeared with a tray of his latest work. It is then that I noticed his rough grown nails, and the black layer of dirt under the nails. To calm any doubts I had about him, the baker proceeded to empty the contents of his baking tray on the shelf, the same shelf where money exchanged hands, and where customers, from office executives to the mechanic taking a break, lay their elbows and hands. 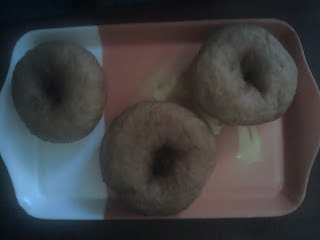 The baker continued to cut the large cake into uneven pieces as I left with my donuts, not bothering with the free juice. The doughnuts did not disappoint in meeting the reputation of their baker, for with every doughnut delivering the squelchy feel of excess oil as one consumed them. The baker on the right continued with booming business, adding a variety of juices, tea and coffee, all for a fee, unbothered by the free juice offered at the left. Hehehe! Let me share this.